In your response you cited three different species and gave pictures of colonies? What were the colonies of? were they P. silvatica and when woud a person expect to find them. I couldnt quite make what you were saying. For a man who travels the world over searching, studying and identifying new species it surprises me how stubborn you can be on the subject. I mean havnt you been surprised over and over again? I know i have. Not trying to bash you just stating my observation. Anyway Good Luck in TN!!!! Isn't that Oakridge from Tenn.? 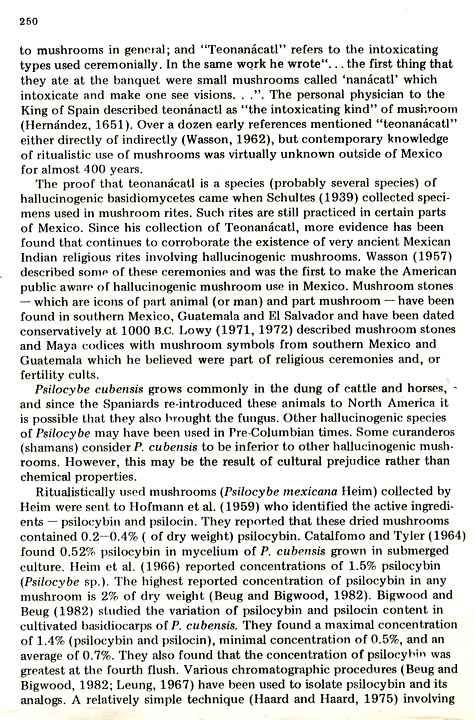 Well there are no herbarium deposits of Psilocybe cubensis in any University in Tennessee at all. 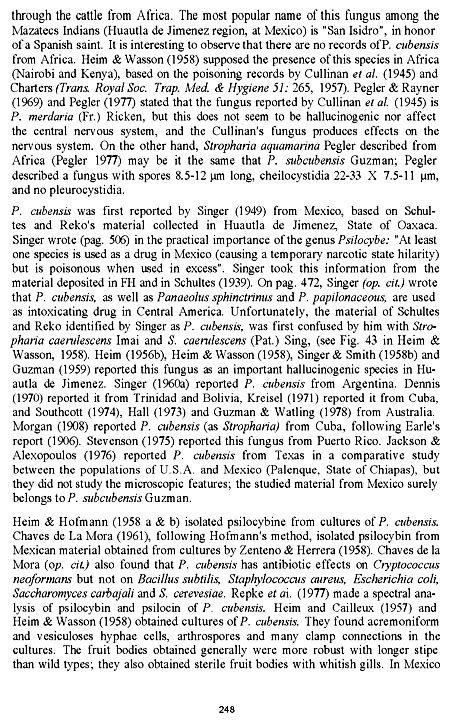 Nor have any been recorded with Dr. Gaston Guzman (The Genus Psilocybe) who is the expert on the taxonomy of Psilocybe. If any are growing they are from cultivated spawn put outdoors and those do not return the following year ever. 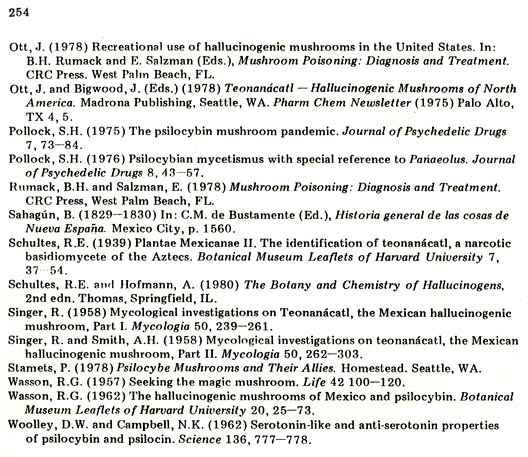 There is also a published field guide By Mycologist Hesler who wrote the monograph on Gymnopilus species which has 13 species which contain psilocine and psilocybine. Heslers book is called the "Mushrooms of the Great Smokies." Mushrooms of the Great Smokies, By L. R. Hesler. The University of Tennessee Press, Knoxville, Tennessee. 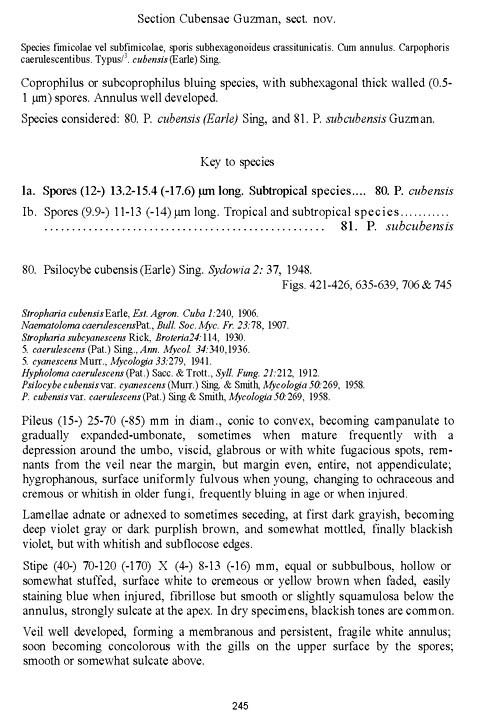 So unless a picker or professional makes a deposit in an herbarium, there are really no known collections of P. cubensis in Tennessee which can be verified as occurring there. 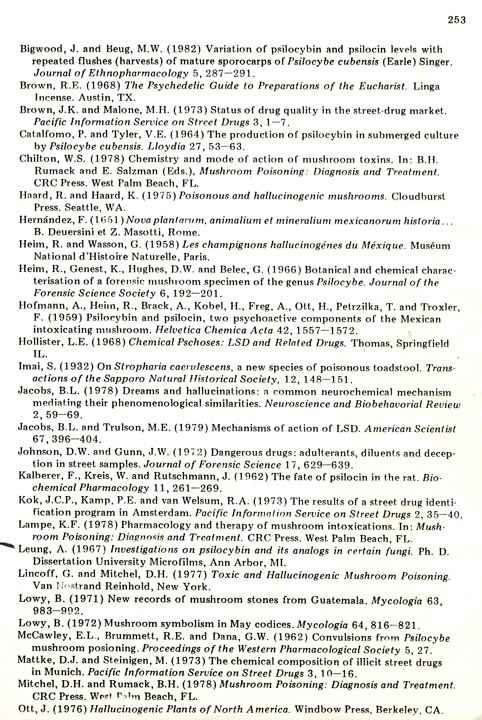 Also, there are many mycological societies (clubs) in Tennessee who forage for edibles and no one in any of those clubs has made a single herbarium collection of P. cubensis in Tennessee or rep0orted in any journals ever that Psilocybe cubensis is found in Tennessee. If you like you can go to Google and find the emails for universities in Tennessee and write them and asked them if anyone has ever deposited P. cubensis and the answer is no. If they were in the state, it would have been well documented as the species grows abundantly in their habitat of manure in pasture lands. As for people saying they find them and eat them. I have shown pictures of Galerina autumnalis, a deadly species which kills, to hundreds of people over the years and dozens have claimed to have eaten them. As someone who has traveled the world and collected mushrooms, Facts are need to verify the existence of that species and their are none which can be based on reality. They do not grow in Tennessee. Maybe you should travel to Tennessee. I know what I saw, picked, ingested. Cubes do exist in TN. The fields in which I personally plucked them were inside of a very small community. I seriously doubt those fields were intentionally seeded for the mushroom. Have you contacted all of the myco clubs in TN, by the way, to make the statement that none have reported cubes? We can agree to disagree, but your statement is not a fact. You know as well as all of us that there are 365 days of the year (approx 90 of them summer) and just because a noted Dr Gaston Guzman hasnt seen them doesnt mean that it could not be. I dont have time to check even my own back yard every day of the spring summer and fall to determine what will or will not produce let alone a whole state. This is an impossible standard. I can understand a scientific approach to say that because of lack of present or recorded physical evidence that it would be safe to say that it is not a probability until proven otherwise, but to say as an absolute that [they do not grow in tennessee] Is not acceptable. But again we should ask.. haven't you found unrecorded and new finds? and what did you do when others said No.. it is impossible.. or that well it was just someones little culture patch..
Another reason that many herbariums are lacking with ps genus could be due to the fact that they are illegal to posses and most citizens are not wanting to go and past their name on some find of illegal mushrooms, or that they are unaware that such a venue should or could be taken. I am on the side of Oibchip and Sangraal and I trust their words.. Not that I would arrange a fieldtrip based on that but you better believe If I'm ever in TN I will stop and walk around in a few pastures with my camera and a newspaper. :amazed: and If i find them I will be a third witness if there is not one before that. 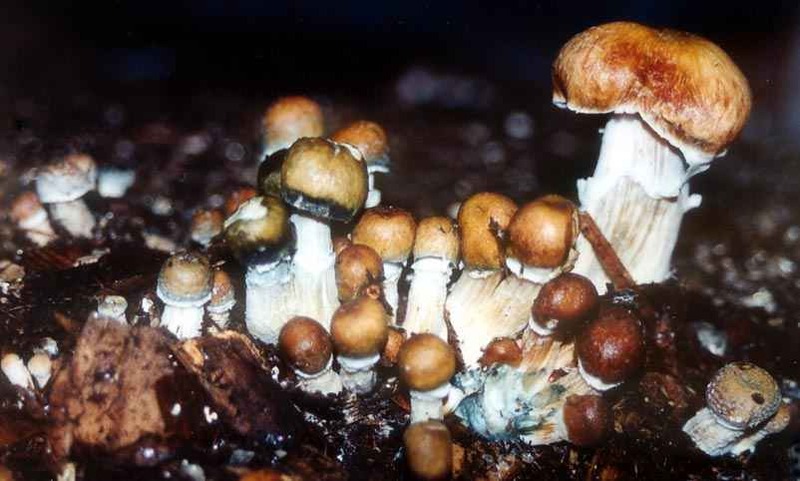 Psilocybe cubensis has been found in the Smokey Mountain area for decades. This is very intresting, It looks like I will have to keep my eyes open. And here is a link that list mushroom species state by state I dont know how accurate it is I got the link off a old mycotopia thread. There's a difference between locals finding a given species of plant, animal, or fungus in their area and the carefully quantified, categorized, and documented occurrence of that species by trained taxonomists. The various species of flora and fauna (and funga?) found by locals aren't caused by hallucinations (and if they were it would support their case actually ;)) and the taxonomists don't dictate the distribution of species, they record them. 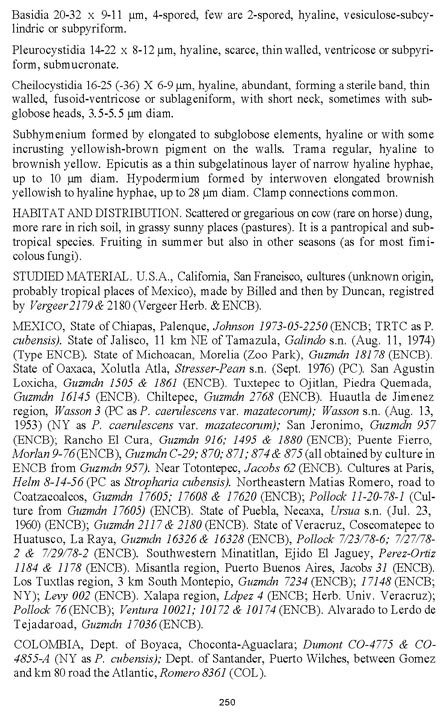 It's often anecdotal reports of locals that initiate taxonomic investigations of an area, so such reports ought to be carefully considered rather than dismissed out of hand IMO. It seems unlikely that there are enough indoor cube growers in TN tossing their substrates outside in random pastures so that others can stumble across them at the precise time they're fruiting, fooling observers into thinking they're natural colonies. It also seems unlikely that there's anything close to a comprehensive mycological survey of the State, and since TN is an ever-changing transition zone in terms of climate I'd expect cubes to follow the pattern of other fungi I've observed there, which is that I've found certain species of edibles one year and then not seen the slightest sign of them for the next 4 or 5 years in a row, then they appear again. Sometimes it's hot and humid there, sometimes just hot. Sometimes winter will be exceptionally cold there, then a few winters in a row will be quite mild. I remember a winter with many nights of single-digit low temps where I was living in TN awhile back, then a few subsequent winters where the lows never dipped below ~20 deg. F. I was up higher than most parts of the state (along the NC border) but the lower elevations were proportionally mild. It gets into the teens quite often in Alabama in areas where cubes are commonly found, so it seems to me they can survive the milder TN winters. The several years-long drought hasn't helped however. To me, Tennessee is like a mountain that cubensis is trying to climb, and some years it makes it pretty far up there then in others it gets knocked back down to Alabama, Georgia, and Mississippi. [quote name='sangraal']Maybe you should travel to Tennessee. I know what I saw, picked, ingested. Cubes do exist in TN. The fields in which I personally plucked them were inside of a very small community. I seriously doubt those fields were intentionally seeded for the mushroom. Have you contacted all of the myco clubs in TN, by the way, to make the statement that none have reported cubes? That page from the University of Tennesee is from deposits made by Badham in 1975. 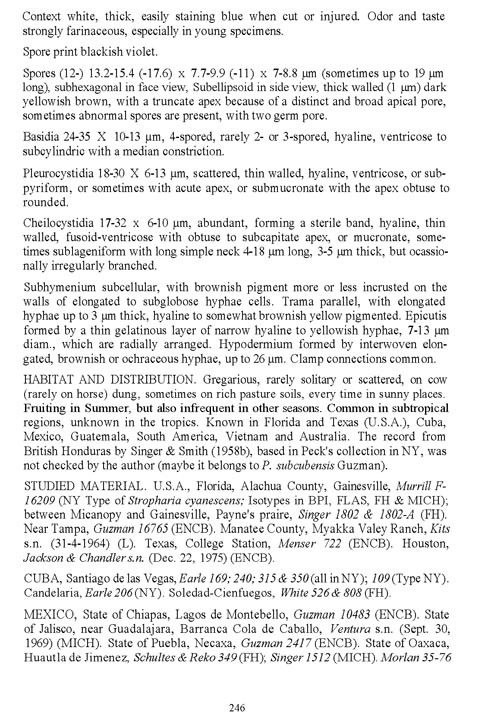 Taher outdated andmore so than The Genus Psilocybe by Guzman. No other cubes have been deposited since. The Police deposit contribution was from a culture pf cubensis, not the actual mushrooms. The Badham collections from 1975 from North Carolina was for E.R. badham's Masters. 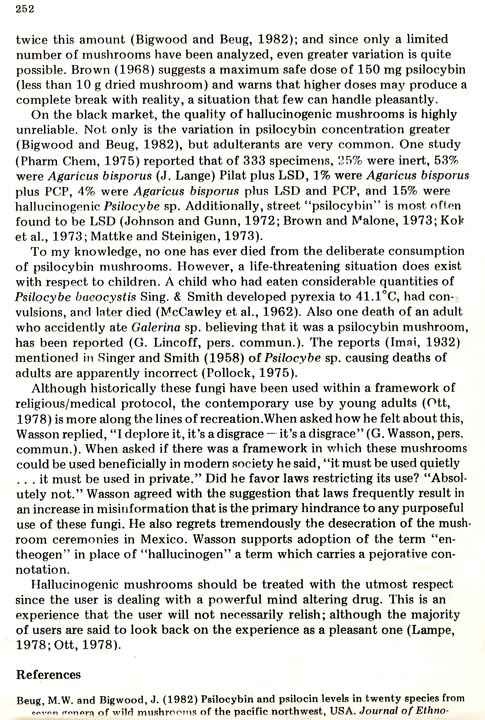 He has written several papers on Psilocybe cubensis cultivation and on the Ethnobotany of Psilocybin musghrooms, Especially Psilocybe cubensis. The last collection was form Puerto Rico. I collect shrooms all over the world and they are deposited in about a dozen Universities, including ones in Thailand, 2 in Hawaii (the university and the Bishop P. Benice herbarium, The University of Leipzig in Germany, Instituto de Ecologia in Mexico, The Reikersherbarium in the Nederlands, Nestles in Suisse, to name a few. 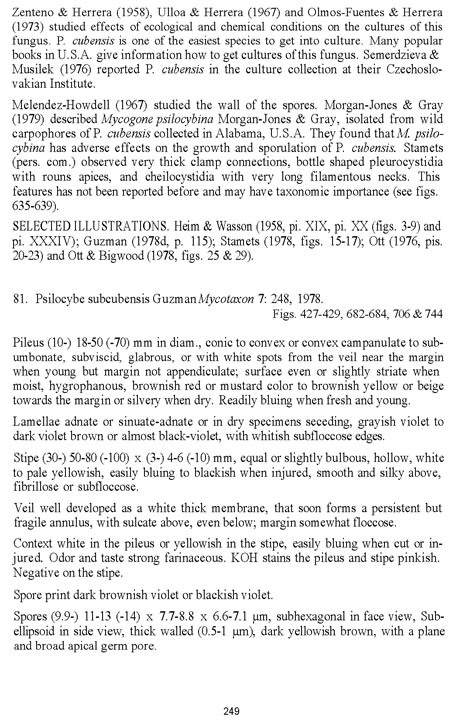 Cubes collected in south southern Oklahoma, Texas, Louisiana, Mississippi, Florida, Georgia, South and north Caroliona are4 documented in several papers by Guzman, Murrill, Singer And Smith, Jacobs, Badham, Guzman in his Genus Psilocybe, currently being revised at this time for publication next year, with newer species not inthe original 1983 monograph and the Worldwide Distribution of the neurotropic Fungi by Guzman, Allen and Gartz (2001). Badham, E. R. 1980. The effect of light upon basidiocarp initiation in Psilocybe cubensis. Mycologia vol. 72(1):136-142. January-February. ------. 1982. Tropisms in the mushroom Psilocybe cubensis. Mycologia vol. 74(2):275-279. March-April. The growth of the mushroom Psilocybe cubensis is studies in a wind tunnel under controlled conditions of wind velocity, humidity, temperature, and light. Badham, E. R. 1984a. 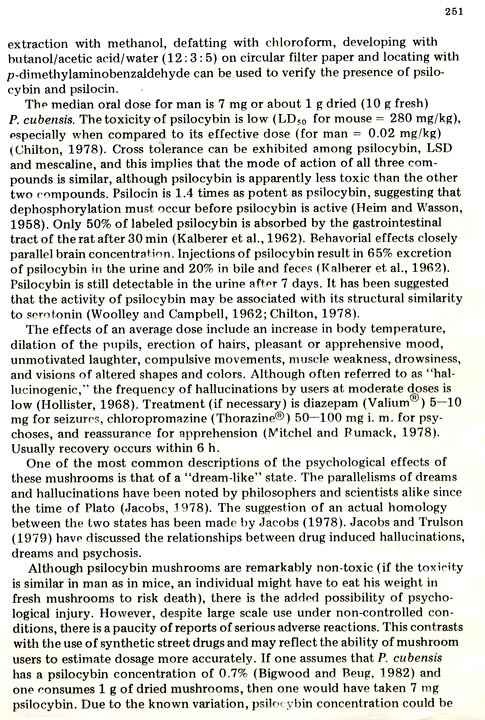 Ethnobotany of psilocybin mushrooms-especially Psilocybe cubensis. Journal of Ethnopharmacology vol. 10(2):249-254. March-April. A short article on the cosmopolitan distribution and use of Psilocybe cubensis. ------. 1984b. Modeling growth, development, transpiration and growth in the mushroom Psilocybe cubensis. Bulletin of the Torrey Botanical Club vol. 111:159. A new method for studying the modeling growth, development, transpiration, and translocation of individual basiocarps of Psilocybe cubensis. ------. 1985. The influence of humidity upon transpiration and growth in Psilocybe cubensis. Mycologia vol. 77(6):932-939. November-December. 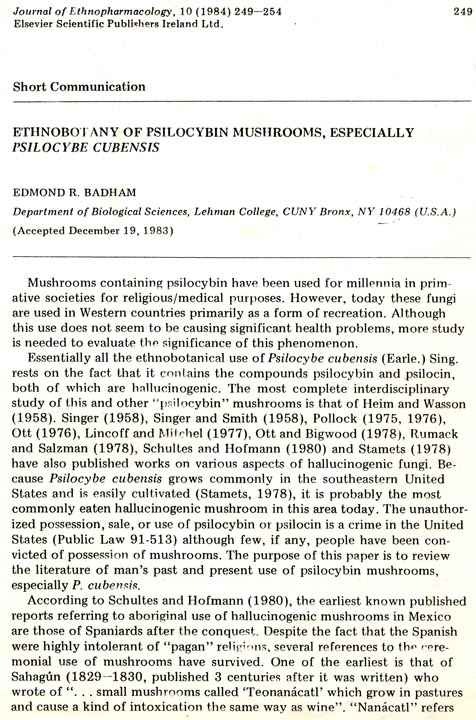 Studies on the growth of Psilocybe cubensis in a wind tunnel is presented (see Badham, 1982 in Mycologia vol. 74(2):275-279). Badham, E. R. and D. T Kincaid. 1984. Analysis of anemotropism in the mushroom Psilocybe cubensis. Canadian Journal of Botany vol. 62:932. And as I said, no more deposits by him or the Purto Rico collection have been made since that time badham made his deposits 33-years-ago. 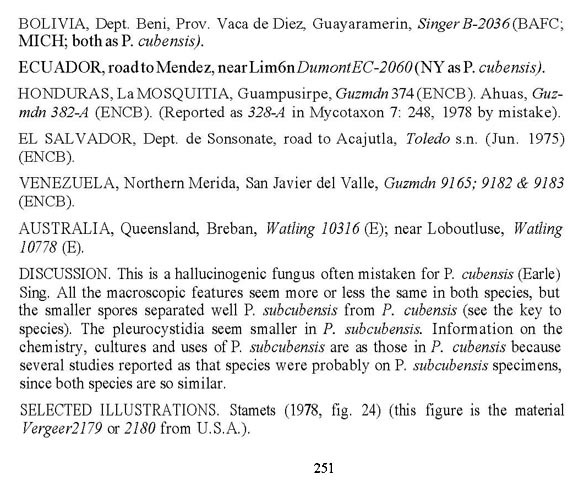 And Below are the Guzman's Pages on P. cubensis collections and P. subcubensis. The Florida, Alabama, Georgia, South and Southern North Carolina, Mississippi, Louisiana, Texas ans south southern Oklahoma cubes are basically a southern semitropical species, usually occurring in climates not too cold at all, although Florida and other southern states do get freeze and frost. One person posted cubes he claimed he found growing wild in Alaska. These were more likely an outdoor created patch at a stable yet the person who poted them claimed that horses were brought from Florida to Alaska. I have even found an outdoor patch of cubes (gulf Coast variety groing outdoors at a friends inthe Olympics who tossed his composte out after several flushes and did not notice them onthe trail into the woods behind his home where hi e collects edible shrooms. Here is a picture of his outdoor patch which came up unbeknownst to him. There are several hundred p members of mycologcal societies in Tennessee and many also collect field mushrooms. If any of them had ever came across a cubensis they would have mde a deposit at a local University herbarium of their discoveries. 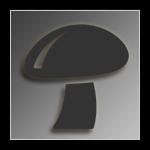 And yes, the Shrooemry has a Tenessee list of shroomers and that site is not the most reliable site for shroom information. 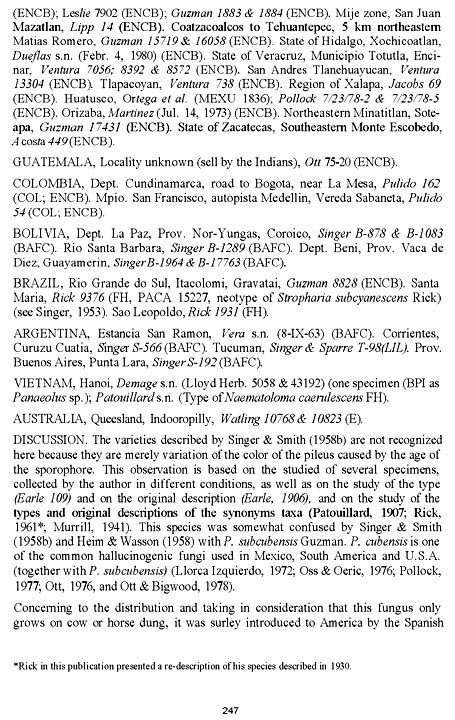 The list mentioned above is form my paper and people are adding species to it with no scientific foundation for the addition of species because the original work by me, Gartz and Guzman is documented by thousands of deposits around the world and in the USA. What someone in Tennesse needs to do to prove their collections is to photograph a wild natural manured cube with a local newspaper showing city and date of collection. That would make it a valid claim. Here is an example of P. cyanescens from Seattle. 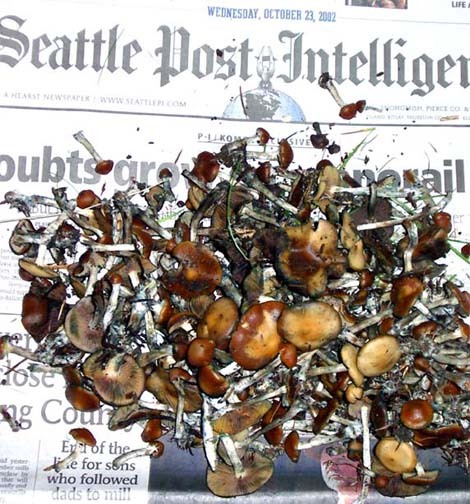 anyone could grow mushrooms with sprouted rye grass, and put it on a newspaper. i don't think a recreational field tripper is going to take the risk and put their name out like that by visiting a depository at a college. he/she's going to trip. The shrooms are there. Isn't it possible that the mycellium could grow past the frost line which would be 3 ft at the most? Then return to the surface in the spring? Or that it just grows to that depth and then everything near the surface dies or goes dormant until the following spring. And also, what about oakridge? One thing I have learned is that life WILL find a way. I'm of the mind that cubensis is far more adaptable than some may credit and it's slowly moving northward and adapting to the cooler climates, year after year. Cubes undoubtedly exist in TN, in the wild, and not just outside Oak Ridge. Pan Subbs, they grow in hay piles, stables, near stables etc. Extreme Northern AL has em. Just south of the TN border. No doubt about that. There are pics here to prove it and they are cow field wild. Here is a link with the photos I was talking about. Old thread. But I’ve been harvesting cubensis in TN since I was 16. Some years they’re plentiful. Some years non existent. All depends on the weather for that year.